Join us for Middle School musical Footloose: April 13 at 2 p.m. and 6 p.m.
MCDS middle school presents Footloose: The Musical, part of the “Getting to know…” series for young actors by Rogers and Hammerstein Organization. Please join us for an amazing production put on by dedicated middle school students, produced by Theater Director James Wagoner, directed and choreographed Leanna ’21 with musical direction by Alexandra ’22. The show runs approximately 1 hour and fifteen minutes including one intermission. This exciting musical filled with great songs and energetic dancing brings the popular 1980s movie to the live stage. Featuring classic 80s hits including Holding Out for a Hero, Almost Paradise, Let’s Hear it for the Boy and the unforgettable title track, Footloose: The Musical is set to take the world by storm once again, bursting with a youthful spirit, dazzling dance and electrifying music. When the film was released in 1984, it became the highest-grossing February release in US film history. The soundtrack album ended the year-long reign of Michael Jackson’s Thriller at number one and went on to top album charts all over the world, eventually selling in excess of 17 million copies. Footloose was nominated for a Golden Globe, and both the title song and Let’s Hear It for the Boy received Academy Award nominations. 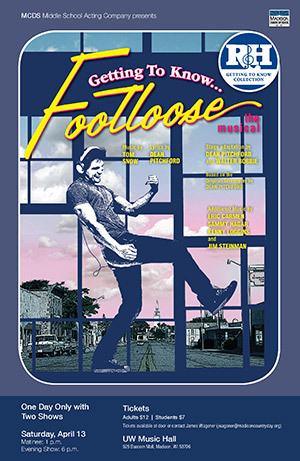 Footloose: The Musical first opened on Broadway in 1998 where it ran for 709 performances, with a London production following in 2006. Our middle school show features a high school production team and fills a long-held dream of Leanna’s to direct and choreograph a show. Having choreographed last year’s successful Crazy for You, Leanna is doing a magical job of working with a talented and energetic cast of over 30 students from grades five through eight. Alexandra, music director, is teaching music and vocal skills and helping the actors learn the arrangements to these classic songs. It has been an incredible process to see these two students work as a team to produce a Broadway-style musical. The benefits to their sharing the experience with our middle school acting company is priceless. We are excited to share this musical one day only with two shows on April 13 at 2 p.m. and 6 p.m. All shows will be at the UW Music Hall 925 Bascom Mall, Madison, WI 53706. Tickets are $7 for students and seniors, $12 for adults. Contact jwagoner@madisoncountry.org for more information.